A locally-produced news story about Seattle’s homeless problem is a microcosm of what Leftist governance will do to a community. You may already have heard about the hour-long special a local Seattle station did about the homeless crisis in that city. The video is very well done, although a bit heavy on the banal philosophical moralizing and curiously quiet about the immediate cause of this problem (which I won’t be quiet about in this post). The images are not new to me. As the video points out, San Francisco, my natal town and a mere 12 miles from my house, is in worse shape than Seattle. More than that, I was present at the genesis of this urban decline because I grew up in the City during the hippie area. Haight Ashbury, a former working class neighborhood that shaded into very poor inner city housing, was a microcosm of what whole cities have become: drug addled people using the streets and Golden Gate Parks as their home, with all the anti-civic behavior that entails, such as public filth (feces, urine, vomit, fleas, lice, etc. ), car break-ins, robberies, muggings, and just a general degradation in the standard of living for those taxpayers still trying to live a traditional life. I don’t know if San Francisco initially put up a fight against these behaviors, but I do know that, by the late 1960s and early 1970s, as the City took a hard Left turn, City Hall turned a blind eye to the lawless behavior driving this civic collapse. It helped that the problem was confined to a few specific neighborhoods: the Haight, the eastern end of Golden Gate Park and, of course, the usual suspects in the Tenderloin area south and west of downtown. The Homeless and Too Many Libs. What to do? Every liberal household with a family income of $150,000 annually must adopt one homeless person into their household. Adopt means food, clothing, shelter and misc. expenses as well as walking around money.They must adopt another if the household income is $300,000. Once all the homeless are cared for the remainder of liberal families must adopt, into their families, at least one welfare recipient. The higher the income level the more welfare people they must adopt. Limousine liberals in government must adopt several welfare recipients. In short, they must put their money and psyches into the mix instead of just their mouths. In one year there will be no homeless and very few liberals. It sounds like an excellent suggestion to me. Of course, both James and I are speaking tongue in cheek. We know that homelessness is a problem, but neither of us believes that the Progressive solution — leaving the homeless free to wander the streets — is the answer. It’s bad for the communities destroyed by increasing numbers of homeless, and it’s inhumane as to the homeless themselves. The Left’s approach to homelessness is yet another reminder that, as Dennis Prager says, we delude ourselves if we think that conservatives and Leftists differ only as to means, not as to goals. For Leftists, visible signs of poverty and (alleged) societal cruelty are an important goal, even if they’ll never say so. At a certain level, all of us are solipsistic, in that we inevitably exist at the enter of our own universe. As it is with individuals, so it is with belief systems. Whether we like it or not, we assume that our way is the way to do things. That others would do things a different way is invariably a surprise (although, as is the case with Dutch chocolate, often a pleasant surprise). One of the things that distinguishes the mature mind from the immature mind is the ability to recognize that your way isn’t always the right way. Sometimes the other person’s (or nation’s) way is fine, even if it seems inadequate. Outside of moral absolutes (or moral somewhat absolutes), what remains are behaviors and beliefs. It’s here that we all fall prey to believing our way is best. Where conservatives and Progressives differ, though, is that, while conservatives believe their choices are best, they do not believe that it is up to government to impose those choices on others. They prefer persuasion to coercion. Progressives, however, are sufficiently self-righteous (or emotionally immature) that they believe that they must impose their ways upon others. What got me thinking about this was a discussion I had with my sister about a couple of homeless men she and her husband have befriended (don’t ask). Both men are enthusiastically homeless. They get government checks, but are incapable of — and, more importantly, hostile to — embracing a middle class lifestyle. The two men live near a city in a somewhat rural area. They can bike to amenities, but live in a homeless encampment in the woods (which means they offer minimal inconvenience to the bulk of the city’s residents). One of them built a teeny, portable wooden structure in which he lives, and powers the TV, the lights, the radio, and the electric cook stove with solar panels. The other dwells in a tent and mooches happily off friends. They get water from a nearby water pipe that the city makes available to the encampment. They get free food from various charities, and spend their government checks on food and drugs. From my middle class, suburban perch, they live a terrible life. From their point of view, though, they’re free men who have all their needs met: shelter, food, chemical stimulants. They don’t want anything more. Both are a little loopy (one has a mildly aggressive paranoia, while the other believes he communes with alien beings), but neither is rendered dysfunctional by those “quirks.” They are free to be themselves. They don’t miss hot showers, and La-Z-Boys, and cars, and the internet, and X-Boxes, and all of the other things with which we fill our lives. Nor do they miss health insurance, which means that they’re in sync with previously uninsured Oregonians who got Medicaid. When they’re sick, that’s what the ER is for. They like that status quo and, despite living in a state that’s embraced government medicine, they refuse to join up. San Francisco has long spent exorbitant sums on the homeless because the Progressive government believes that it can bribe, cajole or co-opt the homeless into adopting a middle class lifestyle. The experience of 30 years of failure has only convinced the Progressives that they need to spend more. They cannot comprehend that, while there are people amongst the homeless population who are genuinely down on their luck and need a hand, there are many amongst the homeless who affirmatively embrace that lifestyle. They are homeless, not because we (society) have failed them, but because they like the freedom that comes with homelessness. They have no amenities, but they have no obligations either. Progressives aren’t insane, notwithstanding the oft-repeated definition of insanity as “doing the same thing over and over and expecting different results.” Solipsism isn’t insanity. It is, instead, a failure of imagination and an emotional immaturity that makes it impossible for a person or belief system to accept other attitudes and desires. 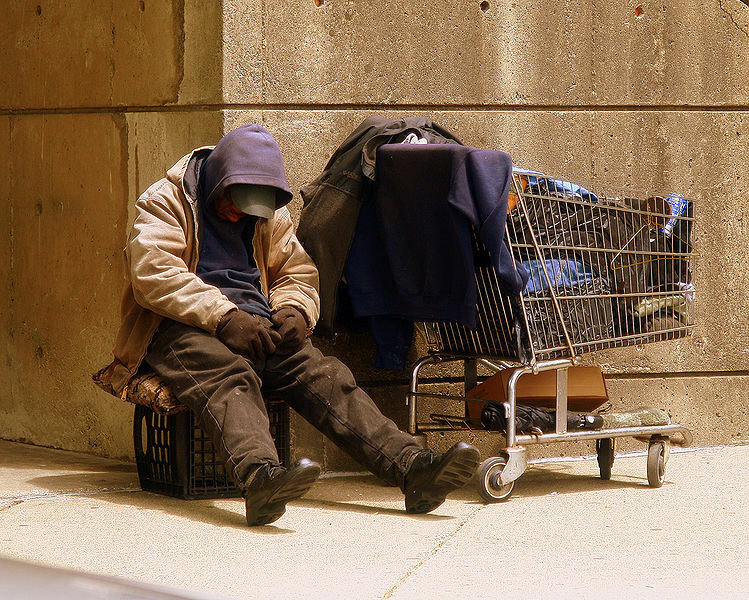 How should cities cope with the homeless? Among other things, the proposed law would require legal representation for anyone cited under such laws as San Francisco’s sit/lie law or anti-panhandling ordinance. However, one provision of the bill can be interpreted to allow restrictions of those activities as long as they are applied equally to all people, and not just homeless people. That leaves wiggle room for evaluation of local ordinances that would probably not spell their immediate dismissal. Ammiano’s proposal makes the news in the same week as two other stories about society’s lost souls. The first was the story of Larry DePrimo, the policeman who, frustrated by his inability to aid a barefoot homeless man, went into a shoe store and bought the man a brand new pair of all-weather boots. The second was the story of a crazed man who pushed a father-of-two to his death on the New York subway tracks. All three stories revolve around a single issue: what should a civilized, affluent society do about those who are too dysfunctional to live a stable life, but are just functional enough to survive on the streets without starving to death? Any discussion about the homeless has to begin by recognizing that there are two different types of homeless in America. The first type, the one that makes for heart-rending headlines telling us that we must socialize our economy, is the down-on-its-luck family. These families are the economic tragedies, the ones who fell victim to a bad economy and lost first their livelihoods and then their homes. The adults are functional, but have fallen through the cracks, created by bad luck and hard times. These “working class” homeless are, in theory, quite simple to help. Give them shelter and childcare, and then give mom and dad a job. I understand that the procedure isn’t as easy as the theory. I’m just pointing out that the remedy is a straightforward one, no matter how challenging it may be to implement it. It turns out the homeless, barefoot man who captured the hearts of thousands isn’t actually homeless. Jeffrey Hillman, the recipient of a pair of boots given by a good samaritan New York City police officer, has an apartment in the Bronx, officials told the New York Daily News. 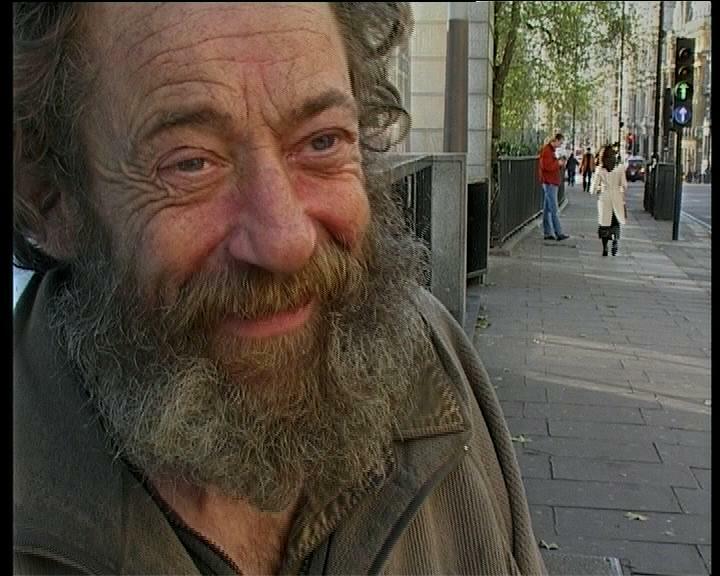 I know Hillman’s type of homeless. You couldn’t miss this type growing up and working in San Francisco. Because San Francisco has a temperate climate, its downtown streets are dotted with filthy men (plus a few women) who sit on the sidewalks all day begging for handouts. It is immediately apparent looking at these beggars that they are not simply slackers who prefer begging to work. All of them show the signs of serious illness and advanced substance abuse. Many of them are obviously seriously mental ill, with the scariest ones have long, angry conversations with invisible companions. The paranoid ones, like Hillman, resist help. They would rather live outdoors, even if outdoors means the mean, freezing streets of New York, Chicago, or Boston, than put themselves in one of the shelters that their delusional minds classify as dangerous. To them, having your own primitive tent, cardboard room, or doorway, complete with tinfoil hat and nearby dumpster for food, is a much safer way to live than anything offered by the “enemies” who surround them. 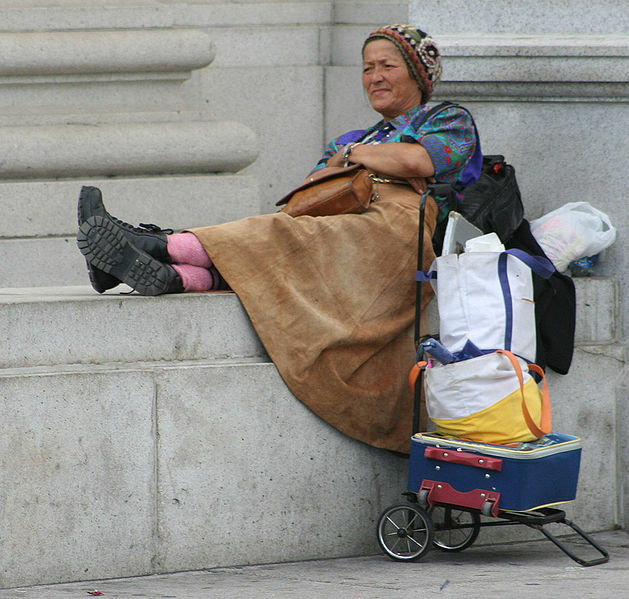 It is these homeless people to whom Ammiano wishes to extend the virtually unlimited right to live on San Francisco’s streets and in her parks. (Incidentally, in San Francisco they live that way already, simply because the City only intermittently enforces its vagrancy laws.) By advancing this right, though, Ammiano manages to forget about the other people in San Francisco, the ones who are not homeless, who work, pay taxes, go to school, play, and otherwise try to live normal lives within the City. You see, the problem of homelessness isn’t just a problem for the homeless. It’s a problem for everyone. The parks that used to see children playing while their mothers sat nearby in cheerful, chatting clusters quickly turn into needle, condom, feces, vomit, and bottle strewn bogs, complete with smelly, often violent men and women camped out on benches and under bushes. The streets with the charming, inviting stores are now a dirty, smelly mess, repulsing casual shoppers. Tourists, tired of being importuned by by a Calcutta-like stream of beggars, stay away. And because the homeless carry with them lice and tuberculosis, they create public health risks. More than that, as I’ve frequently argued, it is psychologically damaging to ordinary people in a community to be told that they must allow a person who is manifestly mentally ill, whether because of disease or drugs, to lie around on the streets. I hew libertarian in most respects, but my support for absolute individual freedom begins to fray when an individual is incapable of caring for himself. Just as I wouldn’t say that a five-year old is free to make her own lifestyle choices, I’m loath to allow free rein to a person so mentally ill that he cannot perform basic human functions, such as seeking shelter or feeding himself. To me, he is as incapacitated as a five year old. The problem is obvious; the solution less so. In the old days, vagrants were thrown into prison, which had the virtue of giving them shelter and food, but also exposed them to criminals who preyed upon them and left them back on the streets when their sentences ended. Another tactic was for the police to tell vagrants to “move along,” getting them off of one cop’s beat and putting them on another’s. The 20th century saw a growth industry in “modern” psychiatric institutions, which treated the mentally ill as patients rather than as zoo animals, as was the case in old fashioned “insane asylums.” Sadly, though, too many of inmates suffered terrible abuse in these institutions. Because they’re unpleasant work environments, too many employees were lazy and/or sadistic, and too many of the doctors were mini-Mengeles, viewing the mentally ill as human chimps for experimentation. The 1960s and 1970s, therefore, saw a coming together of the Left and the Right, both of which groups, for different reasons, believed the asylums were dangerous places for society and for the inmates, and passed legislation to close them down. The law of unintended consequences hit hard when these institutions closed: The mentally ill had no place to go but to their families, who either made them crazy in the first place or who couldn’t cope with their craziness, or to the streets. I don’t have an answer to the question I posed in this post’s title: How should cities cope with the homeless? I know that I disagree strongly with Ammiano’s push to give the homeless a special set of rights that turns San Francisco’s streets into a vast homeless shelter with no recourse for the regular folks who live in and pay for the City. That’s the wrong approach and, to my mind, a cruel one. As humane people, I believe we have a moral obligation to care for those incapable of caring for themselves. The old psychiatric institution model is a good one, because we know that mandatory treatment can work, but I’m at a loss as to how to prevent the abuse that once-upon-a-time made closing these institutions a reasonable decision. UPDATE: Welcome, Ace of Spades readers. If you enjoy this post, I invite you to check out the whole site. And if you like what you see, think about subscribing to the Bookworm Room newsletter. Veruca Salt has been much on my mind lately, probably because I live with a teen and a tween. “I want it now,” is the operative demand in our household. The fact that I routinely turn a deaf ear to that malign howl doesn’t deter the Veruca practitioners with whom I live. The OWS is a political movement made up entirely of Veruca Salts, and that’s true whether the pishers in the park come from the anarchist, socialist, communist, or fairies and unicorn points of view. They don’t want to work. They want to destroy instantly and, meanwhile, they want everyone else to pay for everything. The delusional kids want all their debt to go away and to get high paying jobs (skills be damned) and world peace and transharmonic communications with aliens (and fairies and unicorns). The socialists and communists want the instant takeover of America by a centralized government. The anarchists want immediate chaos — and are in luck, because they’re getting it. The politically correct, victim identity crowd want a segregated society, and they’re damn busy creating one. “We have compassion toward everyone. However, we have certain rules and guidelines,” said Lauren Digioia, 26, a member of the sanitation committee. A long overdue civil grand jury report released Wednesday says that the city should be proud of getting over 4,000 homeless people into housing since 2004 but distressed at the scene on the streets. 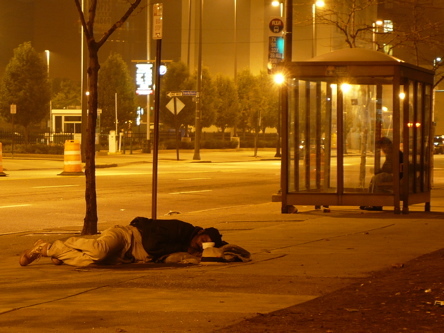 Panhandling, public drunkenness and street loitering are still an unpleasant reality downtown. Read the rest here, because it’s got interesting points about lifestyle choices, civic decision-making, public policies, and the inadequacies (and adequacies) of housing for the poor. When a homeless man named James Allen Hill overdosed and died in the restroom of the San Francisco library last Friday afternoon, it was a shocker. A drug overdose in the public library? Really? There will be those who will see Hill’s death as a failure of the system, another example of how the city neglects its poorest residents. That’s not the story here. The city did anything but neglect Hill. 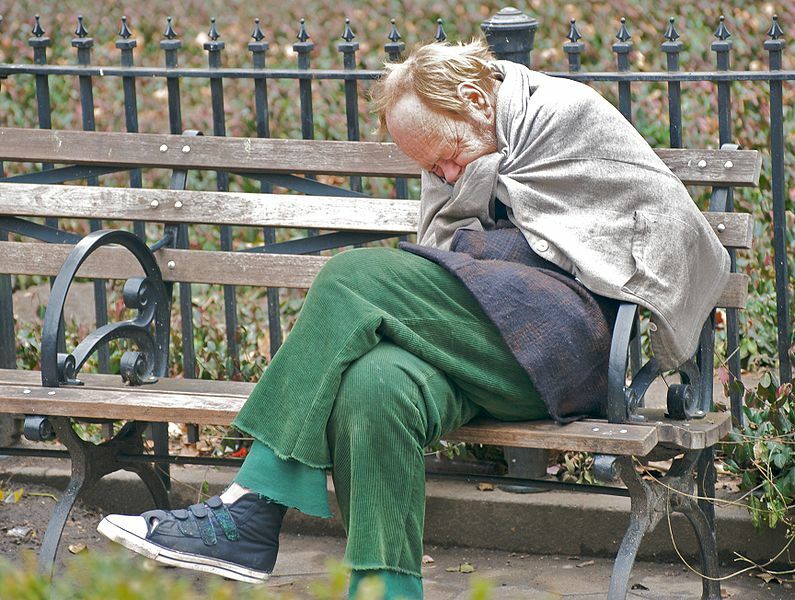 But his case does show a flaw, all right: Chronic and incorrigible offenders avoid the consequences of their actions – aggressive panhandling, public urinating or drunkenness – often through the help of well-intentioned attorneys for homeless advocates. And instead of being placed in treatment, the offender goes back on the street and continues his destructive behavior. Hill is a perfect example. A familiar nuisance in the Haight, Hill slept in a garage doorway near the Panhandle and was a constant, drunken annoyance to residents and police. From Aug. 27 of last year to Jan. 22, Hill was cited at least 15 times by officers, mostly for open alcoholic containers on the street and public drunkenness. Time and again, those citations were dismissed. Often cases like Hill’s never even make it to court. The district attorney’s office says that is because homeless advocate attorneys drag out the process as long as possible, creating a paper bottleneck in the courts with “burden of proof” legal requests. There are so many steps and appeals that any misstep can result in a dismissal, which the DA’s office says is why hundreds of “quality of life”‘ infractions are thrown out. Just keep on reading here. It will make you realize that, just as the alcoholics and drug-addicts have their enablers amongst their families and friends (co-dependents is the word, I think), so too do the homeless have their enablers amongst the more liberal cities.